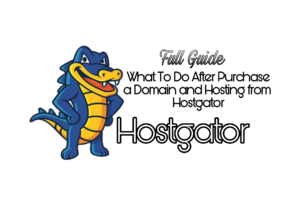 Now What To Do After Purchase Domain Hosting via Hostgator? Today in this article I am going to tell you that after Purchase Domain Hosting via Hostgator now from where to begin. Hey Guys, I welcome you to Geeabo.com, And I have created this community for all those friends who want to know about technology and more. In the Geeabo Community you get a new one article every day. Where I try to tell you some important things about the world of Smartphones, PCs and more. Purchase Domain & Hosting from Hostgator. Firstly, You should root your domain with your hosting to run your domain correctly. Sometimes if you purchase domain and hosting via same server like Hostgator then you may or may not need to root your domain with your hosting. If your domain is not rooted with hosting then you need to root first. Note : After Purchase Domain Hosting via Hostgator you must wait for 24 hours for rooting process for your domain with hosting. Now the question is that how to root domain with hosting manually? Let’s get started just follow my instructions very carefully. You need to go to (“www.hostgator.in/login.php”) Hostgator Login page. Now enter your Email and Password and click on login. After click on login you will come to the home page of hostgator. Now go to “Manage Order” Menu and click on “List/Search Orders”. After that click on Your Domain With Hosting and wait for the new page load completely. Now you can see that 1. Domain Registration and 2. Domain Hosting option. In the domain hosting option click on Name Server and copy both of the two line and close it. And Now in the Domain Registration option Click on Name Server and delete all the three lines from the boxs and paste the both two lines and click on Update. After Doing all the steps wait for 24 hours. Now you may see after search your domain in a web browser “This Website is under construction”. It means your domain name is completely rooted with your hosting. Note : – “This website is under construction” is a default page. Now the question is that – What to do after my domain is running completely or my domain is completely rooted with hosting. For Software, Login to Hostgator go to “Manage Order” Menu and click on “List/Search Orders”, After that click on Your Domain With Hosting, go to domain hosting and click on manage web hosting. After Clicking, a new window comes up named “cPanel” and now scroll down or search “Softaculous Apps Installer” and install a software. Fill all the required text fields Like Admin Username and Password etc. Note :- When you are installing software to your website make sure that the Directory option is empty. If you are installing WordPress. Now Login to your WordPress Account. And if you don’t know that how to Login to the WordPress Account then go to web browser type “www.yourwebsitename.com/wp-admin” now you see a login page of wordpress Enter your username and password and click on login. I hope you like this article that what to do after Purchase Domain & Hosting from Hostgator and you have learn something new with the help of this article. Please Do Like, Comment and Share if you really like this. Thanks for sharing. Which one is best between godaddy and Hostgator ? I recommend you to buy domain and hosting both from Hostgator. By the way both are very popular and believable companies.